COGNITUS technology was presented at the NEM Summit 2017, themed Smart Content by Smart Creators, held on 29/30 November 2017 in Madrid. 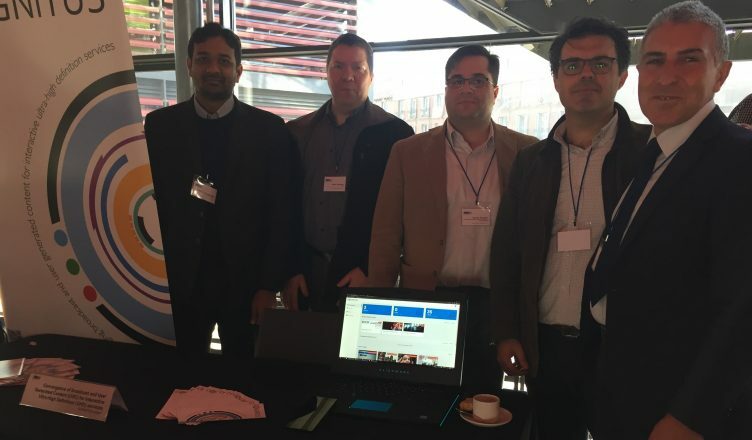 The 10th edition of the NEM Summit conference and exhibition was held in Spanish capital Madrid at the exciting venue of the Museo Reina Sofía with the intention to demonstrate innovative development and stimulate discussions on the latest development in European media, content, and creativity. COGNITUS was one of the projects that was selected to demonstrate its end to end solution. Both client and professional applications developed in COGNITUS were presented to a substantial audience. The attendees showed significant interest. During the discussions exploitation and investment potential were discussed with a wide variety of professionals in the media industry. In addition, fruitful discussions were made with other project representatives towards extending our evaluation process to non-project members. This also provides potential for liaising with external applications. To prove implementation maturity live videos were captured and processed during the demonstrations as well as during the social event. This also demonstrated the applicability of COGNITUS platform to a wide variety of events and the great innovation potential that may offer to broadcasters, providing user friendly tools to engage event participants, select appropriate user generated videos, incorporate then in the main production in UHD and distribute the content in all appropriate formats for all kinds of devices.